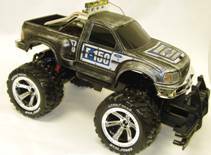 Consumer Product Safety Commission (CPSC) and Nikko America Inc., of Plano, Texas, is voluntarily recalling about 287,000 radio-control toy trucks. A problem with the circuit board causes the toy truck to overheat, posing a fire and burn hazard. The recalled toy trucks were manufactured from April 2003 through January 2004. The trucks are 1/10 scale models (approximately 18 inches in length) of the Chevy Avalanche (model 100021A), the Jeep Wrangler Rubicon (model 100022A and 100022B), the Hummer Wagon (model 100023A and 100023B) and the Ford F150 (model 100024A and 100024B). Model numbers can be found on the body of the truck, along with the vehicle make and model names. Consumer Product Safety Commission (CPSC) and Shindaiwa, Inc. of Tualatin, Oregon announce the recall of gasoline powered hedge trimmers. Hazard: The muffler's retaining bolts can allow the muffler to come loose from the engine while the hedge trimmer is in operation. A loose muffler can contact and damage the fuel tank creating a fire hazard. More than 59,000 Shindaiwa hedge trimmers were recalled in October 2003 because of a leaking fuel cap. Description: The 30-inch and 40-inch hedge trimmers have red engine covers, a red fuel cap and a label on the recoil starter that reads "Professional Shindaiwa." The recall includes all double-sided professional hedge trimmer models DH 231 and HT 231 with serial numbers up to 110000. The serial numbers are printed on a nameplate on the engine cover. Consumer Contact: Shindaiwa toll-free at (800) 521-7733 between 8:00 a.m. and 5:00 p.m. Pacific Standard Time Monday through Friday.